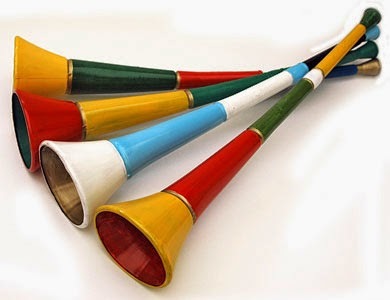 Vuvuzelas, the deafening plastic trumpets, which have attracted complaints from viewers and players alike at this year's FIFA World Cup in South Africa , have been banned from the next World Cup in Brazil. The 127-decibel horn, which left fans reaching for ear plugs in South Africa, is to be banned in 2014. However, it is feared the vuvuzela is set to hit the UK Premier League next month, the Daily Express reports. An estimated 100,000 vuvuzelas are in the hands of British football fans. On Sunday night it emerged most will end up in landfill. Barry Turner, of the Plastics 2020 Challenge set up to boost recycling, said: "Vuvuzelas are made from an easily recyclable high density polyethylene, or PE-HD, but few councils collect mixed plastics like PE-HD." Earlier, FIFA and World Cup organisers had urged fans not to blow vuvuzelas during national anthems, and had already said that they will ban the instrument if any are thrown onto the pitch or used as a weapon.